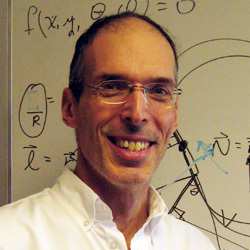 Professor Lichter studies dynamics on the molecular scale. He is currently working on four projects. With Prof. Chris Goedde of DePaul University they are investigating transport of polymers through the nanotubes. With Prof. Ashlie Martini of UC/Merced, they are designing molecular additives for stabilizing the viscosity of lubricating oils. Together with undergraduates here at Northwestern, they are investigating how polymers, such as DNA, develop kinks, that is, sharp bends that are important in dynamics and information retrieval in DNA. Though we make extensive use of computation, our emphasis is on developing simple analytical models and finding closed-form analytical approximate solutions. We enjoy taking very complicated problems, which may be too large even for numerical computation, and trimming them down using physical insight and novel mathematics. Our research group is receiving its first patent. For a group whose method and outlook has been theoretical, we look forward to this new technological direction. Our patent has applications to chemical separation, such as desalination, molecular-scale deposition, such as for quantum dots, and molecular sensing, as for identifying molecular species from a single molecule. Next year, I'll be teaching a new course on Modeling Energy in Society. As you know, energy can neither be created nor destroyed. So, there's always enough energy! But, it has to be processed and distributed. This course treats the role of energy as a causative agent in the growth of society throughout history and how communities, held together by available energy, further enhance their growth and well-being by creating efficient energy infrastructures. Rather than just reading about this fascinating and critical history, we will be formulating mathematical models and running numerical simulations to discover just how energy and society interact. I teach an undergraduate course on Molecular Motors in Biology. This course grew out of an interest of mine in the dynamics of proteins. Check out the course web page which has interactive applets showing how polymers grow and molecular motors move. I also teach a graduate-level course on Nonlinear Dynamics. This is an interdisciplinary course, one of the few at the university (perhaps the only one!) which is cross-listed in eight departments both here in the Engineering School as well as in the School of Arts and Sciences. Not only do we get to learn new techniques for solving equations, the students, appropriate to their diverse backgrounds, apply these techniques to a range of applications from looking at the spiral patterns on cacti to modeling global warming. See a few of the topics we've studied by clicking here.